March | 2010 | I made that! A confession: I’m not into tropical fruits. Well, bananas excluded. All others I feel pretty lukewarm about. And pineapples? Yuck. Not a pineapple fan. But then something happened. My friend Josh made this cake for me at my goodbye San Francisco party. It was pure heaven. 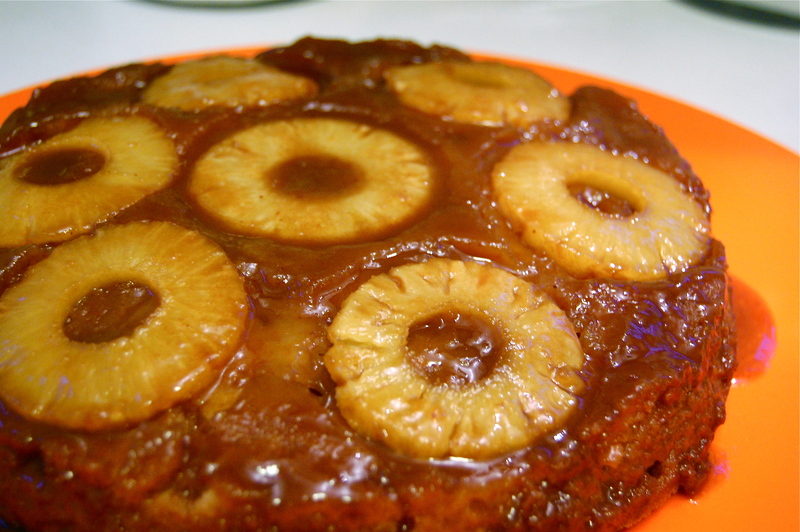 And now I’m hooked on pineapple upside down cake. It was my first time even purchasing a pineapple. And photographing it? How do you photograph something so odd looking? I settled on an outside shot, because it just looked weird in my kitchen. 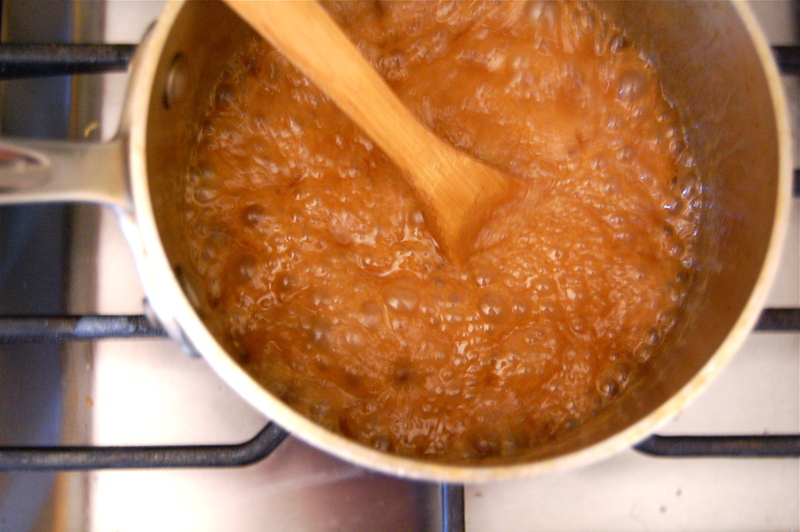 I started by making a salty, sweet, dark butterscotch sauce. Once ready, I poured the sauce into a 10″ cake pan. And then I begin the task of dissecting this alien fruit. 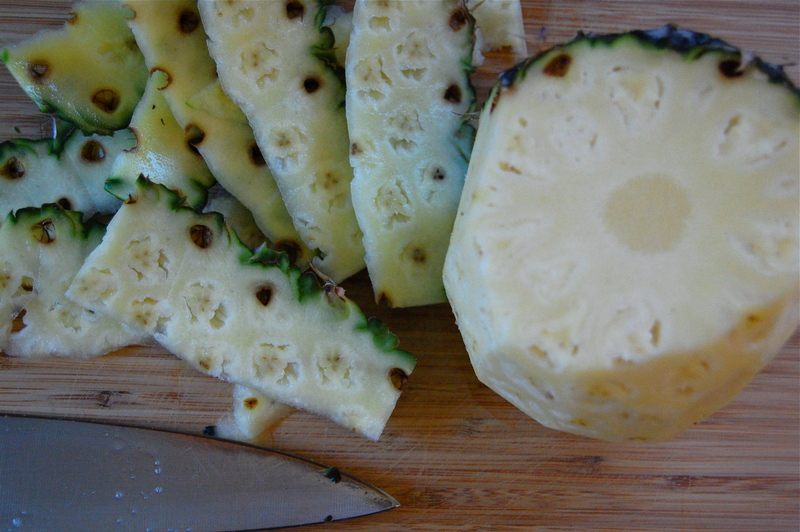 And then I got a little obsessive about making perfect little rings out of pineapple, using cookie cutters. I nestled my slices in the butterscotch sauce. Then I made the most fabulous almondy cake batter. And spread it all over the pineapples. And I loved it. I love pineapple cake. 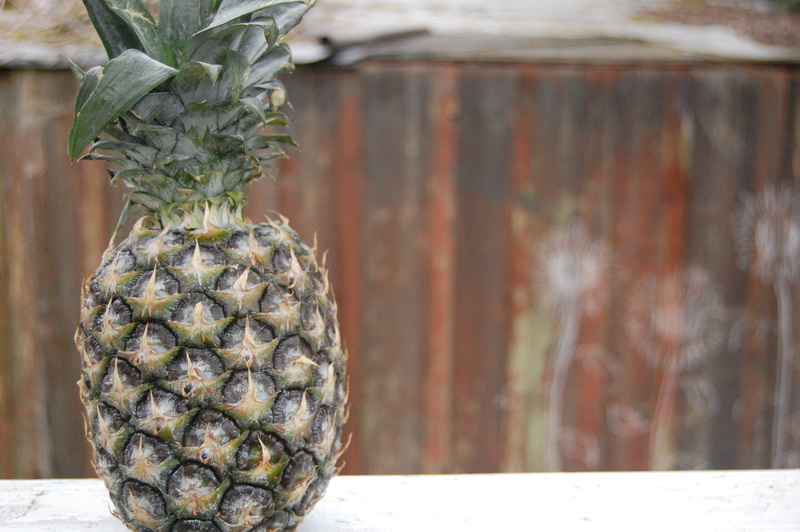 Maybe I even love pineapples. – Melt butter in saucepan. – Add brown sugar, moisten. – Cook on medium heat 3-5 minutes, stirring occasionally. – Whisk in cream, vanilla and salt. – Cook on medium high heat for 10 minutes, stirring occasionally. – Scrape the seeds from the vanilla bean and rub the seeds into the sugar to break up clumps. – Whisk the flours, almonds, baking powder, and salt in a large mixing bowl. 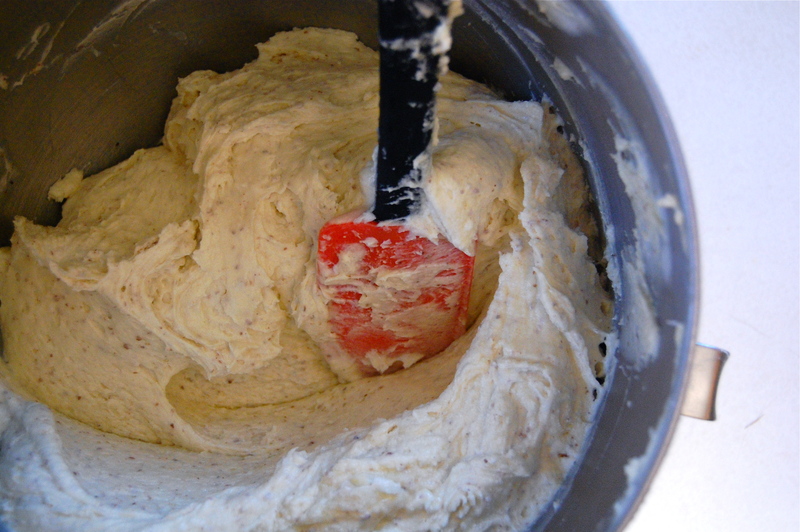 – Cream butter on medium speed for 1 minute. Slowly stream in sugar while continuing to beat. Add eggs one at a time, beating after each addition. 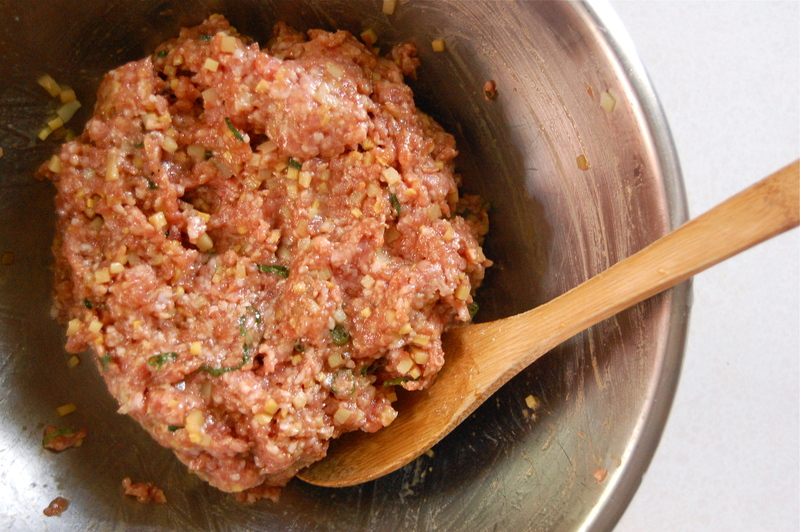 – Add dry ingredients alternately with sour cream, beginning and ending with the dries. 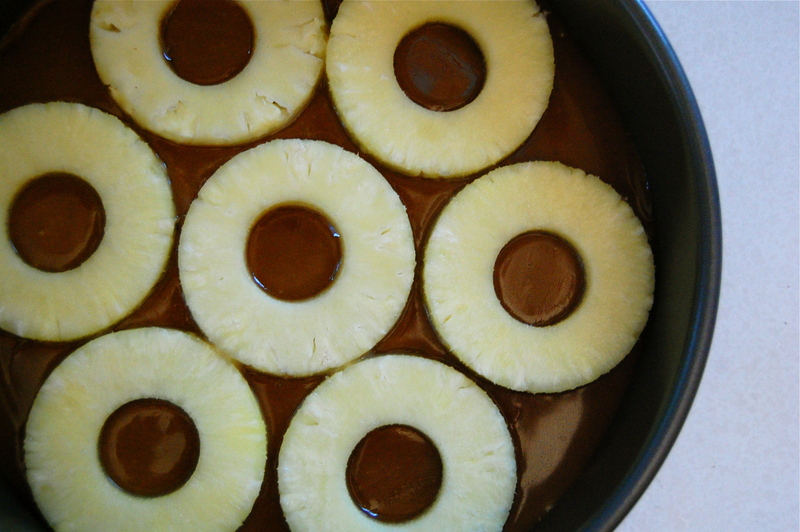 – Pour cake batter over butterscotch and pineapple in pan. 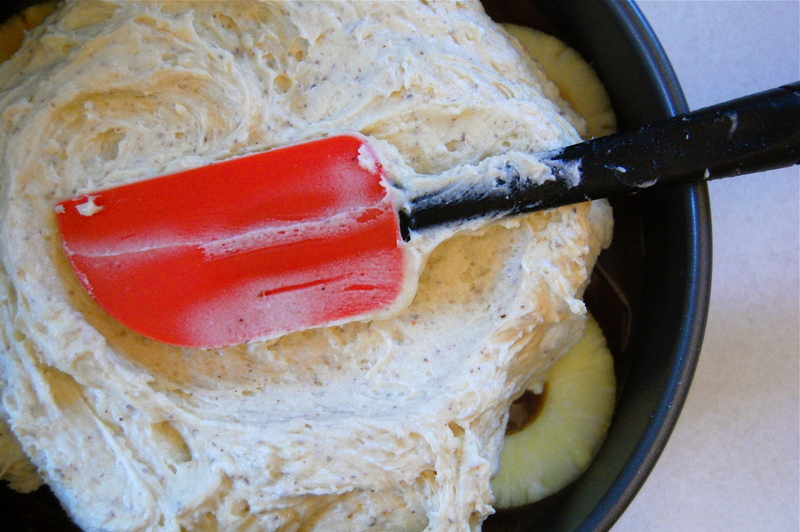 – Bake cake until tester inserted into the center comes out clean, about 1 hour. Cool cake in pan on a rack for 10 minutes. Turn cake out onto a platter. Serve warm or at room temperature. Fun! Fun! Fun! I made potstickers! It’a been on the list for a while. But I’ve never cooked Chinese, so I just never needed an appetizer to match. This week I decided it was time. 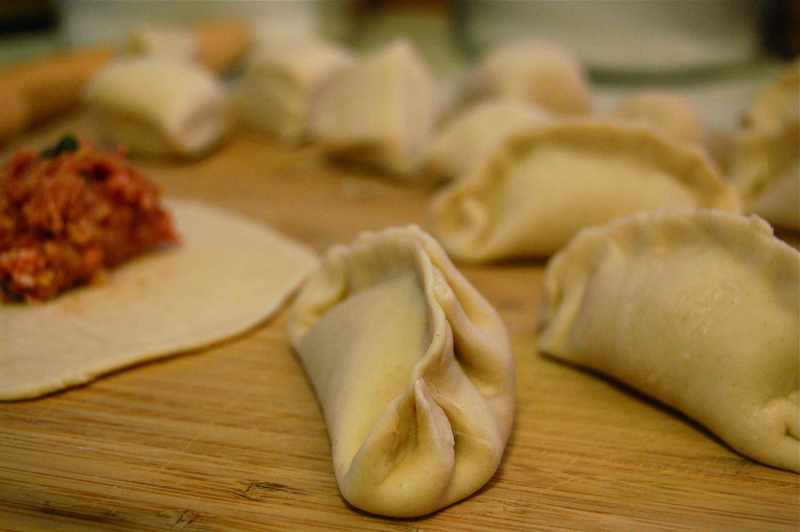 I was making Kung Pao Chicken (ok, so maybe that’s not REAL Chinese) and potstickers were in order! There was a bit of chopping involved. But that was the hardest part. At least for the filling. And there was a dough. I was skeptical at first, because all the recipes called simply for flour and water. But it worked! I rolled out little 4″ discs and plopped on some filling. And then I made little pleated pouches! So damn cute! I fried the pouches in peanut oil, then poured in some water and covered them so that they could steam. And they were delicious! Well worth it. I even made extra ones and froze them for later. 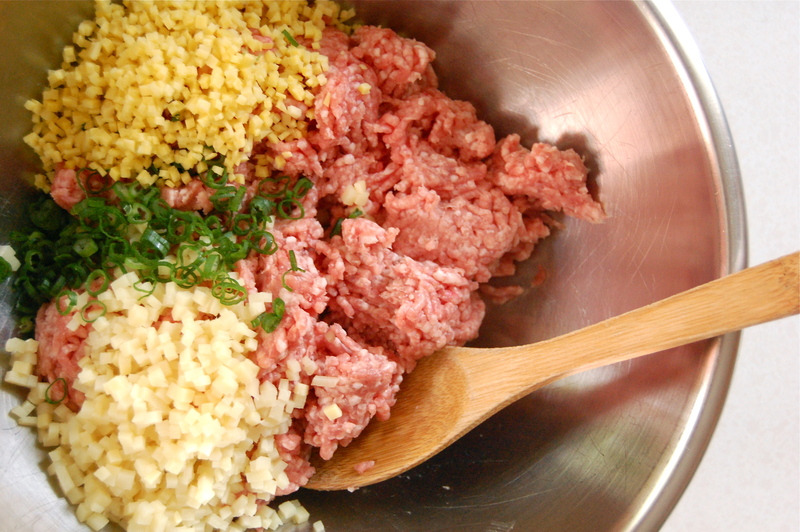 – Throw everything in a bowl and mix well. Cover and store in the fridge. – Put flour and half of the water in a bowl and stir with a fork. Slowly add in more water, a TBSP at a time. Once it is stiff enough, knead. Keep adding water until it is smooth, but not sticky. You might not use all of the water. 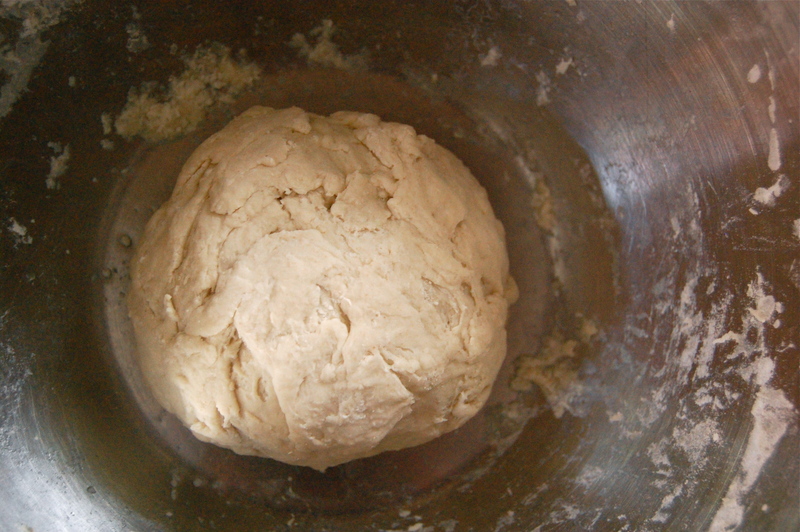 – Cover with a damp towel and let sit for 30 minutes to relax the gluten. 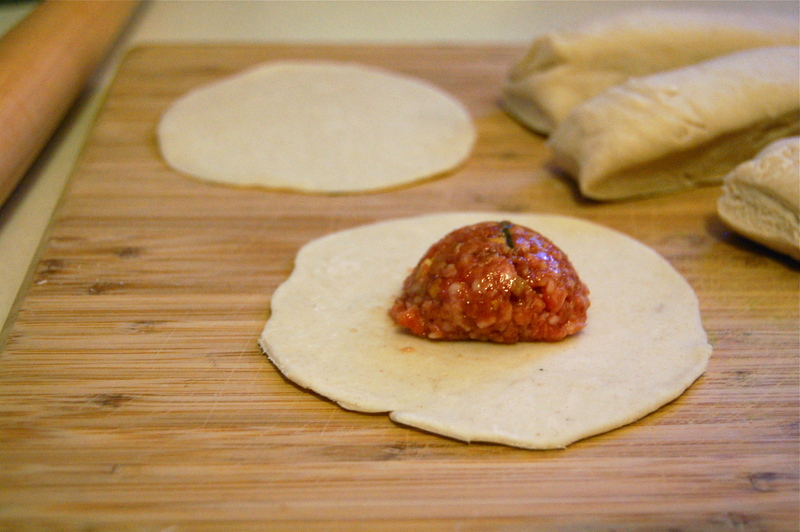 – Cut into chunks and roll into 3-4 inch discs. – Place roughly 1 TBSP of filling in the center and shape into a pouch. – Heat oil in a pan over high heat. 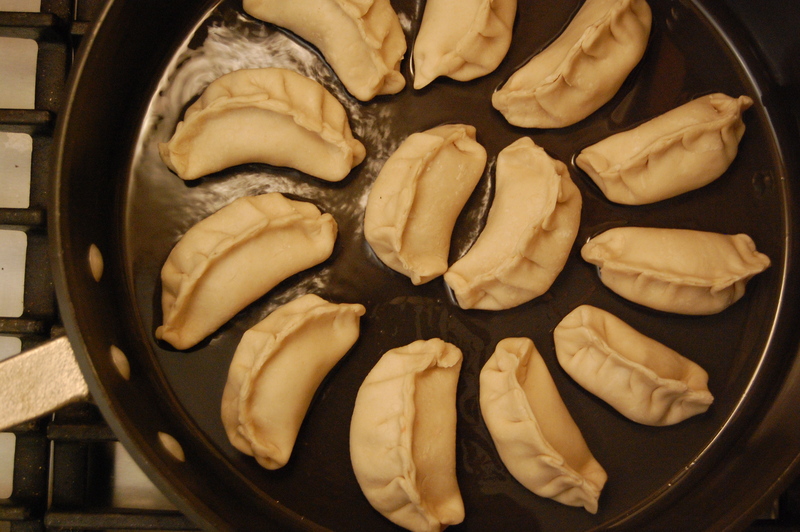 Place potstickers in pan and fry until the bottoms are nice and browned. – Shielding your face with the lid, pour in some water (1/2 a cup or so) and cover immediately. Lower heat to medium low and cook for 6 minutes. 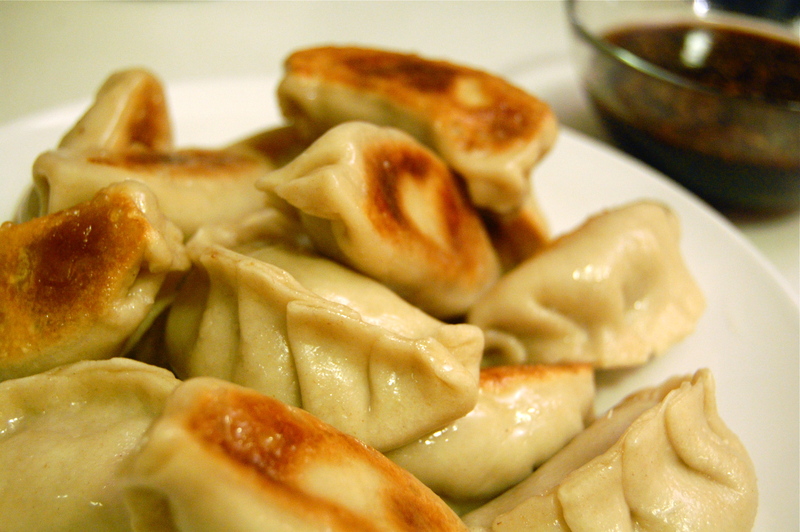 – Place potstickers on plate to cool while you mix dipping sauce.